Spoil yourself with this unique luxurious getaway. A 2 storey apartment set in a secluded and private 20 acre vineyard provides every indulgence -2 person spa, king-size bed overlooking wood fire, plasma screen TV/DVD, Foxtel. Private and spacious balcony and BBQ. Modern kitchen with stainless steel appliances enable you to "cook up a storm"! If you're feeling active, have a hit of tennis on the all-weather tennis court or just laze by the pool. Indulge in the luxury of this spacious, new, architecturally designed two-storey apartment. 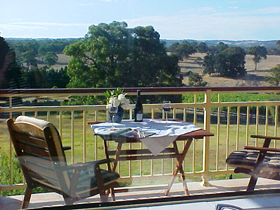 Enjoy a magnificent panoramic view of the Southern Vales and the spectacular sunsets from your own balcony or from your two-person ensuite spa. Raked ceilings and windows above French doors create a magnificent cathedral effect that provides you with a unique experience of connection with the serene rural environment. You will appreciate the quality appointments, the romance of a king size bedroom on the mezzanine floor overlooking the cosy open fire and the tranquil ambience of the surrounding vineyards. This gently undulating 17 acre property is situated in the Adelaide Hills at the gateway of the winding road through the McLaren Vale wine district accessing renowned restaurants and places of historical interest. 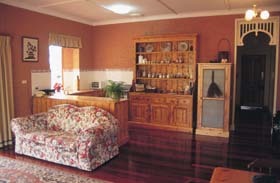 Amanda's Cottage 1899 has been welcoming guests since 1995. 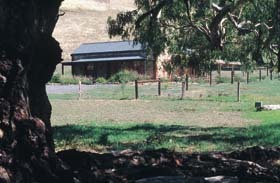 This superb country cottage is set amongst huge gum trees. 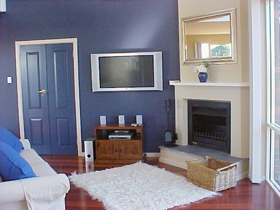 It has everything you need to relax and unwind, but is still close to all McLaren Vale has to offer. 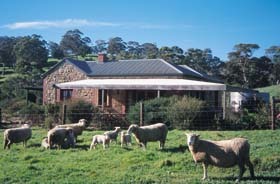 Watch the sheep graze or the wrens in the garden. Experience country life at its best without neighbours.